We'll be playing shows across Austin all week, come find us and say howdy! "Melding the two-step shuffle of Austin, Texas with bandleader Rich Russell’s fondness for Gram Parsons, The Lonesome Heroes call their blend of indie rock and country “cosmic American music.” Here’s a live performance of their new single, released in June 2017, shot at Laramie's NU2U thrift store." "The Lonesome Heroes initially caught on by following in the cosmic cowboy tradition of legends like Gram Parsons, leaning on the lonesome end of their name in particular with their song stories about the hardships of the travelling life. But this year, they’re tweaking their sound, revitalizing it with elements of Texas boogie rock and smoky ’70s sessions by gangs of musical outlaws trying to avoid the spotlight. Their new single “Cloak and Dagger” invokes Warren Zevon more than it does Gram Parson, with its ramshackle vibe and throaty vocals. Meanwhile, B-Side “Hope” recalls the band’s more lonesome roots but with the addition of peak-era Laurel Canyon elements, like a lost collaboration between Stephen Stills and the Byrds. Both tracks are dazzling displays of the Lonesome Heroes wide ranging alt-country, and as a treat today we’ve got them both available to you for free for downloading! So give them a listen, then head out to Cactus Cafe tomorrow, July 1st, to see the band in action!" "It's tough to pin The Lonesome Heroes to any one music genre. The Austin, Texas-based band calls its brand of music Cosmic Americana, which takes it beyond a little bit country and a little bit rock 'n' roll into the territory of indie music. "The term comes from Gram Parsons and the Flying Burrito Brothers - hippies starting to play more country," said Rich Russell, the band's vocalist and guitarist. "Cosmic Americana music is not hugely different from notion of Americana in general: Country, blues and rock 'n' roll all came from the same place. So it's cosmic and slightly psychedelic." So stoked "Western Style Saloons" is included in the soundtrack for the final season of Bloodline alongside some of our big time musical heroes like Lou Reed, Cat Power, Billie Holiday, Nicole Atkins, & Jennifer Jackson. 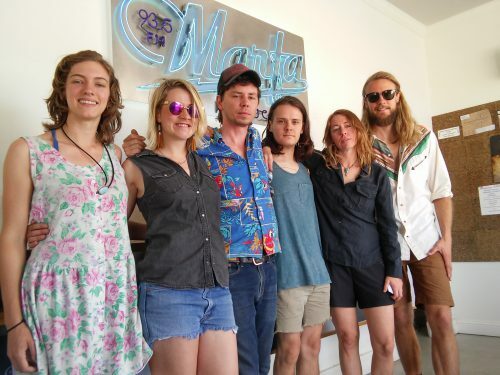 "On this edition of West Texas Talk, a double dose of music live from the Marfa Public Radio studios – Provided by The Lonesome Heroes (Austin) and Whippoorwill (Colorado)." We are super excited to represent our hometown again this year at SXSW.